At Economic Development Winnipeg, one of our YES! Winnipeg business development team’s goals is to attract new companies to expand here. One company, which recently announced they were expanding to Winnipeg, is Hinduja Global Solutions (HGS) Canada. Their expansion to Winnipeg is expected to bring 200 jobs to Manitoba in 2018 (150 of these in Winnipeg). YES! Winnipeg has been working with HGS Canada to help the company feel welcome as they enter the Winnipeg market. 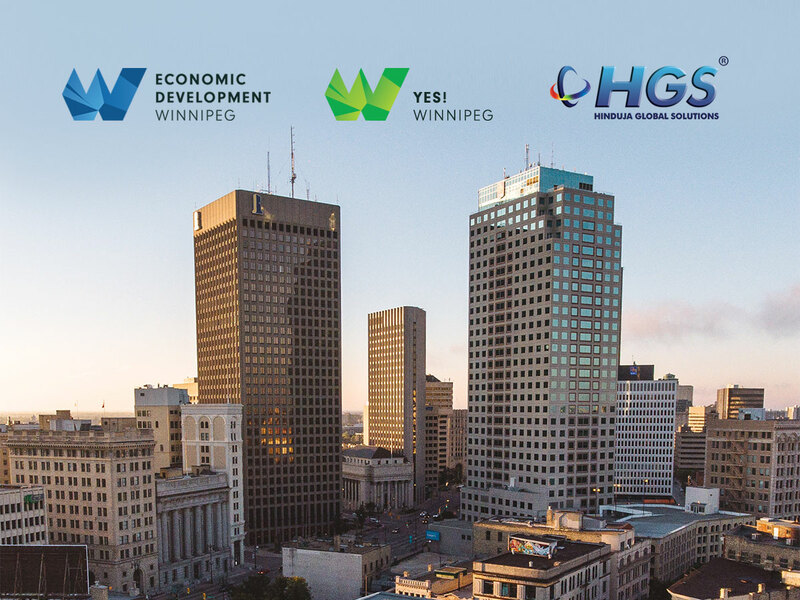 EDW recently sat down with Marco Colaiacovo, HGS’s Director of Strategic Partnerships, to learn about their company and their plan for job creation in Manitoba. Tell us about HGS – what is your company all about? HGS is a full-service business process management provider. We’ve been in business for over 40 years, with 69 centres of operation in seven countries worldwide, including here in Canada where we employ over 2,000 individuals. However, we’ve never been west of Ontario before and are excited to continue to grow our national footprint, starting in Winnipeg. "I’ve never seen a jurisdiction or group of organizations come together for a common cause as much as HGS has seen working with YES! Winnipeg." We are good at what we do, exemplified by having 75% of our client base with us for over ten years. We will continue this success through our Work@Home strategy. Very simply, instead of commuting to a central contact centre, we send you the equipment so that you can work at home. This model allows us to reach out to a greater talent pool that a bricks-and-mortar site can’t appeal to. With Work@Home, you won’t have to worry about commute times or rush hour traffic. HGS’s role in the Work@Home initiative is to empower a greater talent pool. For example, we can offer employment to people who are mobility-challenged. We bring equipment to our Work@Home employees – all you need is an adequate Internet connection, an analog phone line and a quiet space to work. HGS provides the rest of the equipment needed to set up a home-based office. Working from home is a real benefit for rural communities because it means fewer people are commuting between cities. There’s also a positive financial benefit for our employees with this initiative by reducing travel costs. A daily commute has additional costs including gas, take-out coffee, and more. We estimate that working at home saves our employees about $4,000 annually, which equates to a difference of about $2 per hour worked. It’s significant. Why did you select Winnipeg as a hub for your Work@Home expansion? HGS’s growth trajectory right now looks like a hockey stick – we’re forecasting massive growth for many years. This has given us an opportunity to scale up our operations across Canada, including Manitoba. Winnipeg gives us an opportunity to find a talent pool we’ve never really looked at, since this is the first time we’re expanding west of Ontario. We can scale up quickly and cost-effectively here in Winnipeg because we will be going beyond a brick-and-mortar site. The diversity of the city’s population is also something that attracted HGS, because it meets our business need of being able to offer a multilingual global service. "HGS’s growth trajectory right now looks like a hockey stick – we’re forecasting massive growth for many years." How did YES! Winnipeg help you select Winnipeg as your next expansion location? We’ve been in communication with YES! Winnipeg over the past several years, and more concretely since 2016. Since then we’ve travelled to Winnipeg multiple times for market visits, with YES! Winnipeg coordinating meetings with several groups, allowing us to set up some important professional relationships and introductions into the Winnipeg business community. We’ve been able to educate these networks about HGS, our Work@Home initiative and its benefits, and why we provide a great solution for our clients around the globe. I’ve never seen a jurisdiction or group of organizations come together for a common cause as much as HGS has seen working with YES! Winnipeg. Working together, we saw cooperation between various associations and groups – it came out in a way you don’t see elsewhere. Everyone in Winnipeg is rowing in the same direction, making it easier for everyone. What is the future of HGS in Winnipeg? "We want to be firmly entrenched across the province, with a goal of getting us to 500 jobs." In the next few weeks, we’ll be coming back to Winnipeg to meet with several groups including chambers of commerce of rural communities around Winnipeg– we want to maximize our entry in the regional market immediately. We’re starting by hiring for 200 positions across Manitoba – 150 of those in Winnipeg, and we’re looking to fill all those positions by the end of this year. Over the long term, we’re growing at the speed of business – which is quite fast, because of the large client demand we are currently seeing. In the next three years, we want to be firmly entrenched across the province, with a goal of getting us to 500 jobs and maintaining that number over the long-term. Given the level of excitement and growth potential we’ve seen so far, this is a realistic target. We see real potential in Winnipeg, and in Manitoba.